The edited text for EX3 is now completely in layout. Art Director Maria Cabardo still is delivering a piece of art every couple of days, and she is also starting to do what we call "bulk layout". That is, she is dropping in the edited text into a very simple layout format in order to see if the fonts and the font sizes that she wants to use work for the text, and very importantly, just how many pages this tome actually is. It'll only be a rough ballpark, but that will give us an idea of where we stand. Do we need sections removed, do we need to increase or decrease font size? These are the decisions we are looking at. Because this is Maria's first book design work on an Exalted book, and because it is for the new look we want to go with the new EX3 edition, we still can't say how long this process will take. For the best quality, she needs to be able to play with the format, and myself and the devs need to be able to insure that any of her directions feel right for Exalted as a whole and EX3 in particular. This may happen very smoothly or we may have some false starts, we'll just have to see as she works on it. Now that we are at this stage, I'll be talking with the devs in some detail to go over the other aspects of the Deluxe Exalted 3rd Edition KS, like the unique Charms and such, and nailing down how those Rewards will roll out to all of you. And, I'll be at Mid Winter Con in Milwaukee if any of you are going or are in the area, and I'd love to chat if you're there. Brennen Willer, Alexander S. Thompson, and 43 more people like this update. I find it hard to believe that there's no connection between that dinosaur picture and the linked picture. They're really very similar. I also approve of Siakanado! I'm Foxcalibur and I approve of the new Solar Circle Spell, Siakanado. On further examination, I speculate the new Solar Circle spell is one that either allows folks to walk calmly underneath deadly marine predators or that allows fire to burn underwater. I kinda hope it is not another "blow stuff up MOAR" spell, even though the exploding lumber yard is a cool picture. "Siaka in the Mist" a new travelogue featuring a group of DB scholars studying the mysterious mist monsters of the Gombe...spoiler, it only ends well for the sharks. I must confess that I love the artwork even as the tyrant lizard pose makes my back ache in sympathy. Thanks for sharing! I like that the tyant lizard's in the "old school" vertical tyrannosaur pose. I like the style of these artworks, they do a good job of capturing the dramatic, mythic feel of Exalted--the one with the dinosaurs is my favorite! They fit the new logo, too, which looks very cool. I'm assuming the layout is aiming for a similar aesthetic...this game is gonna be great, keep up the good work! We need a Sharknado charm. @Holden I presume the solar circle spell is whatever is turning that forest into match sticks with an unearthly red glow. My other guess is it's Summon Bigger Dinosaur. @Rich. You dont see an uncanny similarity to this pic: http://ecx.images-amazon.com/images/I/61sR%2BBqUcTL._SL500_AA300_.jpg and the dino-like pic above? The poses, action, morphology... even the positioning of the foliage is close to a mirror image. Its not an exact replica... but, man, it looks remarkably similar. I dont think its plagiarism or anything like that, just an Exalted-ified pic of one of my favorites. Edit - Sorry, the Jackson remake of King Kong, not hit as yet unmade remake of Fantasia. That would be interesting. Seriously, its a FANTASTIC homage to the White painting that manages to touch on both the T-rex/Stegosaurus fight form the Rite of Spring section of Fantasia (THAT make a paleo like me weep bitter tears, awesomeness and Stravinsky notwithstanding) and the V-Rex/Kong fight in the Jackson remake. And to be fair the River Dragon's depiction has been fluid down the years (I always thought of it as Sarcosuchus imperator, but I'm biased) and the Mosasaur does give it some character. Oh, and I assume the third picture is a Tyrant Lizard and a River Dragon? I suppose the new spell is the second image, since that looks the most like sorcery. But "Summon Flying Super-Shark" would be truly awesome. @Chris It really is not. Same theme though, so maybe that is what you mean, but the art style, the imagery, poses, etc, the plant life- no connection. Oh, I do hope it's a Solar Spell that summons giant fog sharks! Erm. That dinosaur pic? 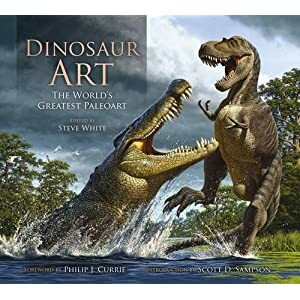 Its almost exactly the same art as the cover of "Dinosaur Art" by Steve White. I dont know if that was intentional, but it is uncanny. Confirmed: Dinosaur Fight is a spell in 3E. KS-exclusive spoiler: One of those pieces of art depicts a new Solar Circle spell.